Choosing the perfect kitchen worksurfaces for your home is an important task, and if your the one doing the choosing, you will certainly want to get it right! Our exceptional collection of almost 700 work surfaces for kitchens offers homeowners a delectabe choice of work surfaces direct from the most prestigious brands in the industry. Opt for the distinguished Tandem walnut butcher block with its rich tones and hardwearing finish, or embrace the speckled hues of the Prima lava dust work surfaces kitchen top. All of our work surfaces are available with huge discounts - grab a bargain today! Your new work surfaces need to be easy to clean, hardwearing and stylish, which is why it is important to make the right decision. Explore our entire range of work surfaces for kitchens to discover beautiful kitchen worksurfaces for considerably less than the recommended retail price. Ensure the style of the surfaces works for you and select work surfaces direct from our exlucisve designer range. Take a closer look at our discounted work surfaces kitchen range and enjoy access to several different styles to determine which of our beautiful surfaces works for your home. Experience the exceptional quality of true craftmanship when you purchase one of our cut price top brand kitchen surfaces. We stock kitchen work surfaces from big brand names including, Prima, Omega, Apollo, Artis, and Duropal. Our cheap work surfaces are cheap in price only, not in quality, and will be a welcome addition to any modern home. Choose from stunning work surfaces in a variety of styles, materials, and colours at HC Supplies, and take advantage of our fantastic sale prices. Make purchasing kitchen work surfaces simple by shopping online at HC Supplies. We can deliver work surfaces direct to your home at a convenient date to suit you. Simply give our friendly customer services team call after purchase to arrange delivery. Customers can expect their items to be delivered between 2 to 7 days from purchase, ensuring you can update your home as soon as possible. 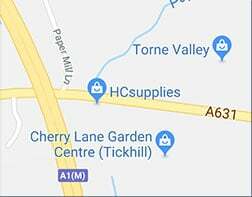 All HC Supplies deliveries are carried out by trusted drivers with the knowledge and experience to ensure your items arrive on time and in perfect condition. Refurbishing a home abroad? Take advantage of our shipping services and have your work surfaces deliverd to your address overseas. Again, to organise this, simply give our customer services team a call. You can also contact us online if you prefer - pop in your details and one of our team will be in touch as soon as possible. Should you need help selecting the ideal kitchen work surfaces for your home, you are welcome to visit our Doncaster showroom, or to contact our teams to discuss your needs. You will find each member of staff extremely helpful, and highly trained within their field. Why not chat to one of advisers about our complete design services, and transform your kitchen into the kitchen of your dreams?